It wouldn’t surprise you to see that most of the career goals-per-game leaders had their best years in the 1980s. You’d expect to see players like Bossy (no. 1), Mario Lemieux (no. 3), Gretzky (no. 7) and Brett Hull (no. 8) on the list. But there was another ’80s star lurking in the top 10 until this most recent season, when Steven Stamkos nudged him down to no. 11. And like Nilsson, his name may not ring many bells among the younger generation of fans. • His mustache/mullet combo was fantastic. • I assumed he was a super cool guy because I had a hockey card of him accepting the Masterton Trophy, and he hadn’t bothered to dress up. • He scored pretty much every time he touched the puck. Kerr put up those monster totals despite a decidedly slow start to his career. He went undrafted before signing with the Flyers in 1980, and after missing most of the 1982-83 season to injury, he’d spent the first three years of his pro career having managed just 54 goals total. But he’d double that career total by racking up 54 goals in 1983-84, and then matched that again in 1984-85. That was followed by back-to-back 58-goal seasons, giving him a streak of four consecutive 50-goal seasons that still stands as the Flyers’ franchise record. Injuries struck again, wiping out most of his 1987-88 season, before he put up one more big year by scoring 48 goals in 1988-89. 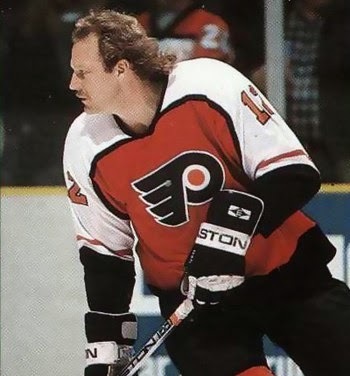 He retired in 1993 and still sits third on Philadelphia’s career goals list, ahead of better known stars like Bobby Clarke, John LeClair, and Eric Lindros. The ’80s were a turbulent decade for goaltenders. The list of Vezina winners reflects that, as not one goalie managed to win the award more than once. And even the ones who did get their hands on the trophy often did so while putting up inflated numbers in the process. It’s not easy to pick a standout from that list, but I’ll go with Edmonton’s Grant Fuhr, who was named the league’s best goalie in 1987-88 despite leading the league in goals allowed. That’s not even the surprising part, since at least some of Fuhr’s votes were in recognition of his league-leading 75 games played. He had a reputation as a big-game goaltender and a winner — he was basically hockey’s Jack Morris — and he did lead the league with a career-high 40 wins. When the award was announced, nobody batted an eye. In fact, Fuhr also finished second in Hart Trophy balloting as league MVP. All of which makes it sort of stunning to look back at his actual numbers. That season, Fuhr recorded a goals-against average of 3.43 and a save percentage of .881. Neither of those were in the top 10 leaguewide, but they weren’t awful. It was just the 1980s, when every goalie got lit up. For example, Patrick Roy led the league that year with a .900 save percentage. Today, a .900 probably gets you shipped directly to the minors (unless you’re Martin Brodeur). Of the 61 goaltenders who played at least 20 NHL games last year, here’s a full list of those who had a worse save percentage or goals-against average than Fuhr’s Vezina-winning 1987-88 season: Dan Ellis. That’s it. Everyone else matched or beat Fuhr’s numbers. This game was played a few months after the two teams met in the 1985 conference finals, in which the Oilers established an NHL record by scoring 43 goals in six games.. As you can see, 1980s teams kind of missed that memo about going into a defensive shell during the playoffs. All of this leads to this question: Did NHL defensemen actually do anything during the ’80s? Well, yes. They did what everyone else did. They scored goals. Take one of the most offensively gifted defensemen we’ve ever seen, surround him with the greatest offensive powerhouse of all time, and then drop them all into the greatest offensive era ever. Add it all up, and the numbers start getting kind of silly. How silly? Try a 48-goal season, which Paul Coffey managed during his Norris-winning 1985-86 year. That topped a decade-old record by the immortal Bobby Orr that had been viewed as unbreakable. It was also one of only three 40-goal seasons ever recorded by a defenseman (we’ll get to the third in a minute). To put the number in some perspective, the most goals scored by a defenseman since 2000 was Mike Green’s 31 in 2008-09 — and that season was the only one since the 2004 lockout in which the top two scoring defensemen have managed 48 goals combined. Nobody else has managed to score more than 26 since Al MacInnis had 28 all the way back in 1993-94. As for that third 40-goal season by a defenseman, it was also by Coffey, and it may be my favorite. In 1983-84, he put up 40 goals and 126 points, both of which were the highest totals ever produced by any defenseman other than Orr. And yet Coffey didn’t win the Norris that year. He came second to Rod Langway, who just missed catching Coffey in the scoring race by, uh, 93 points. Maybe it’s just me, but I love the idea of a defensive defenseman winning the Norris in the middle of the craziest offensive decade in modern history. I’m assuming the writers saw Langway accidentally break up an odd-man rush or block a shot one time, and they were so impressed by that unheard of innovation they just had to vote for him. How Will Liverpool Compensate for the Loss of Luis Suárez?